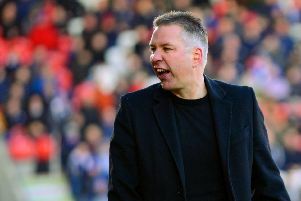 Analysis: Doncaster Rovers 3 Wycombe Wanderers 0 - Is fortune favouring the brave? Grant McCann applauds the fans at the end of the game. There was nothing lucky about Doncaster Rovers’ emphatic win over Wycombe Wanderers. But, with new boss Grant McCann at the helm, fortune might just be favouring the brave. Herbie Kane impressed on debut. McCann, whose team scored three second half goals for the second successive weekend to brush aside the newly-promoted Chairboys, has been as good as his word thus far. Before a ball was kicked this season he promised excitement, attacking intent and goals - and two games in his team has delivered on all fronts. The manager’s willingness to take risks has been fundamental to an entertaining and encouraging start to the new campaign. He wants his full backs to bomb on. He wants his midfielders to be flexible and rotate. He wants his attacking triumvirate to play with energy, flair, pace and width. He wants bodies in the box, and he’s prepared to gamble defensively to do just that. And when his team do score, he wants his team to score again and not simply protect what they have. Against Wycombe, McCann got what he wanted - eventually. Rovers showed plenty of endeavour during a relatively even first half but it wasn’t until after the re-start that they clicked into gear in the final third. They probably ought to have gone behind early on when Adebayo Akinfenwa fluffed a header from point blank range. But from the moment McCann’s men went ahead, when Mallik Wilks swept home another stunning strike on 55 minutes, the result never really looked in doubt. Confidence soared and centre back Joe Wright found himself upfield to coolly round off an excellent move for his first ever senior goal. And Rovers’ smiles became even broader a couple of minutes later when substitute Matty Blair charged forward from right back and played in John Marquis who beat Ryan Allsop at the second attempt. That Marquis has netted in the first two games is a huge fillip for McCann. But Rovers’ prized asset has arguably been outshone by Wilks - who has added an element of unpredictability to the attack. Rovers became too predictable and too ponderous in the final third last season. Stop Marquis scoring, stop Doncaster winning. Now Rovers appear to have a frontline with threats coming from all angles. And in Wilks they have a player who can produce something out of nothing, a maverick, someone from which to expect the unexpected. Along with some of his showman antics, McCann appears to have certainly unearthed a player capable of getting bums off seats. You won’t find McCann dwelling on any negatives or stressing out about the opposition. And his positive mindset - which appears to have rubbed off on his team - was perfectly illustrated after the game. “It’s all about us,” he said. “I knew Wycome hadn’t been beaten away from home since December before the game. “But I didn’t tell the players about it. “The lads need to feel that this is a very good result. Wycombe are riding on the crest of a wave and are used to winning. The final word belongs to Herbie Kane for one of the best home debuts ever witnessed at the Keepmoat Stadium. Rovers have been lacking a midfield general/enforcer. But on this evidence they might have found a missing piece of the jigsaw. The 19-year-old was outstanding from start to finish. He looks a class act.